If I close this window and start the Manager again - everything is fine, information is displayed correctly. Until half an hour later, when it becomes inaccessible again. Already started guests continue running, but new guests can't be started. Trying to investigate the problem I have uninstalled the VirtualBox and installed the latest version (it's 5.2.8). I have created two guest machines: one for Windows 7 guest, the other one for RedHat linux. All other options are default. No guest operation systems actually installed into these guests, and guests not started. When I start VirtualBox Manager everything is ok. I do not even power on any guests, just switch to some other application. 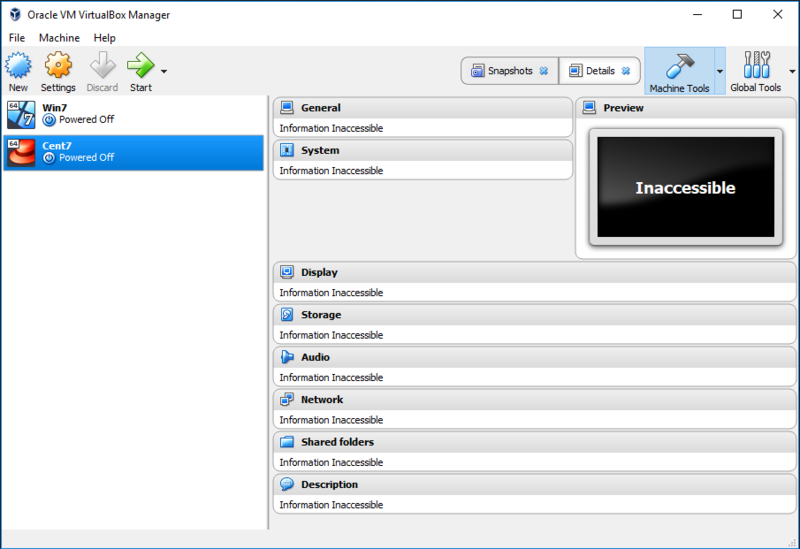 When later on (in about 10-30 minutes) I switch back to VirtualBox Manager the information about guests is already inaccessible. My host OS is Win 10, all the latest updates installed. No antivirus. Any ideas about how to fight this problem are welcome. This problem persisted for over a month, but looks like it's solved now. It's gone after I turned off "Fast startup" option on my host Windows 10 system and rebooted the system. I am not absolutely sure, but looks like I have not rebooted the host system since VirtualBox was installed. (Yes, VirtualBox suggested reboot after installation). I have shut down the host computer several times, but they say that with "Fast startup" option turned on the shutdown is not good enough. Most probably the simple reboot would have solved the problem as well as the "shutdown/power on" with "Fast startup" option turned off. Virtualbox Guest memory limitation with 64bit guest on 32bit host? Using Virtualbox on a Windows host, how can I route all traffic from a specific guest through TOR without changes to the guest?